My least favorite grocery store is about six blocks from my condo. In moments of forgotten ingredients or an excuse for a productive errand, I can walk there in eight minutes. It’s huge; always full disgruntled employees, screaming children, and endless boxes, bags, and cans of food. These were the foods of my youth. We were a normal midwest family on a budget, unaware of this strange contradiction, articulated so well by Michael Pollan, of eating out of packages whilst surrounded by fields of fresh produce. And yes, I did just use the word “whilst”. It worked. On a recent trip down the street, I had a flashback to childhood as I passed an endcap neatly stacked with newly redesigned packages of Suddenly Salad. My first thought: “That stuff still exists?” Followed by a recollection of dehydrated carrots, peas, and, I think, bacon, within those boxes. It sounds like space food, but we loved that stuff! It’s one of those things you could let kids make, mixing Miracle Whip with the contents of a powder-filled dressing packet, and that’s exactly what Mom let us do. Like it or not, I associate those goopey cold pasta shells with carefree summer memories: nights spent playing tag in the cool, freshly mowed grass as the sun disappeared, and with hundreds of dinners eaten in the porch after a day of swimming at my grandparents’ pool. If you gave me a blind taste test of the stuff today, I have to confess that I’d probably clean my plate. No matter how well it gets along with my taste buds, though, my awareness now of processed food keeps me from consciously eating Suddenly Salad or any of its counterparts, except on super rare occasions (I’m not perfect/unwilling to starve at picnics). But chilled pasta salad is a summer must have. It’s one of the few substantial foods that actually sounds good when it’s 90 degrees outside, it’s easy to transport to potlucks, and a single batch can last a few days in the fridge when it is just too dang hot to turn on your kitchen appliances. Super creamy, smooth, flavorful dressing is unquestionably the key to transforming cold noodles (blah) into an addictive summer pasta salad, and that was the premise for this fresh tomato dressing recipe. You could totally mix up a batch of this, toss it with some of those cold noodles and call it a day, or you could wait a couple days to see it in action in my antipasto orzo salad recipe. 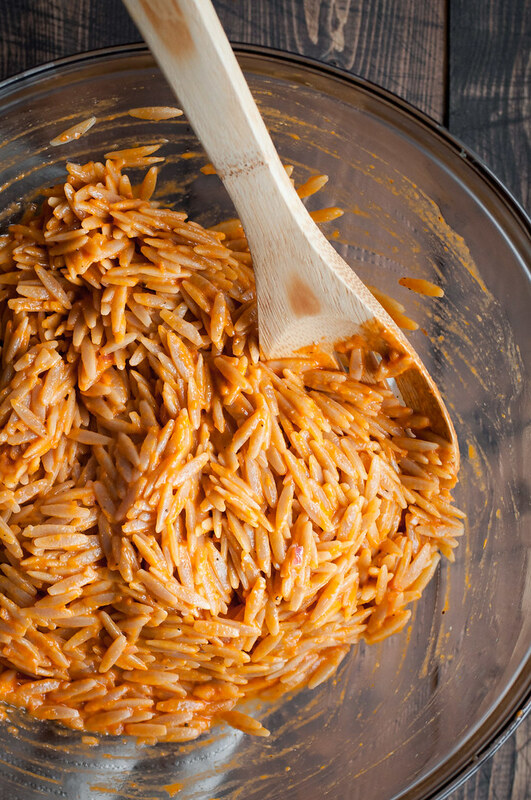 Not all condiment recipes deserve their own blog post, but as I was writing up the orzo salad recipe, I couldn’t fight the fact that this creamy tomato dressing, which exceeded every last one of my expectations, has so much more potential. It makes a tangy, voluptuous, dairy-free dip for grilled or raw veggies or a quick sauce for warm pasta, tossed with fresh herbs and a little parmesan cheese. Heck, I wouldn’t judge you if I caught you eating it with a spoon, mostly because that’s exactly what I was doing yesterday. 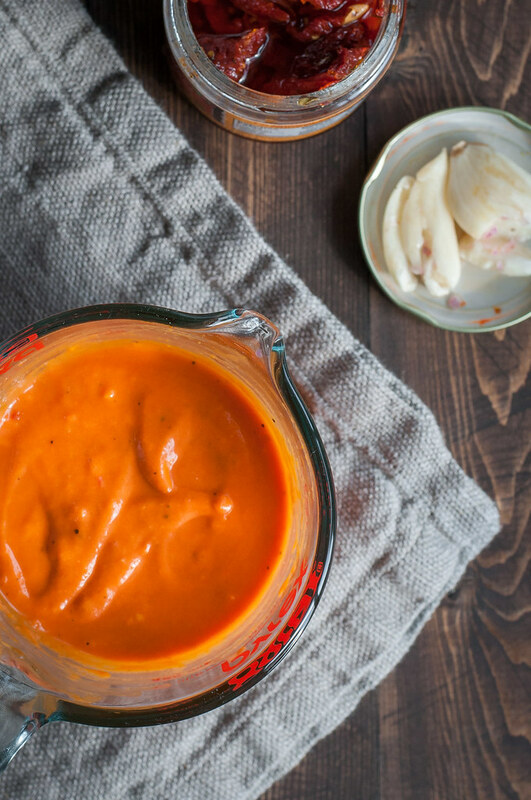 For those of you who like to know the reason behind the recipe, puréed fresh tomatoes, emulsified in the blender with oil, give this dressing recipe its full, thick texture without diluting the flavor. I thought the finished product would come out more like a thin vinaigrette, given the tomatoes’ high water content, but instead it fought me in the blender (patience is required) and then rewarded me with exactly what I sought. A dressing that’s creamy without mayo or dairy, with a summery orange hue that makes a pretty pasta salad without covering the ingredients in a layer of heavy, white dressing. 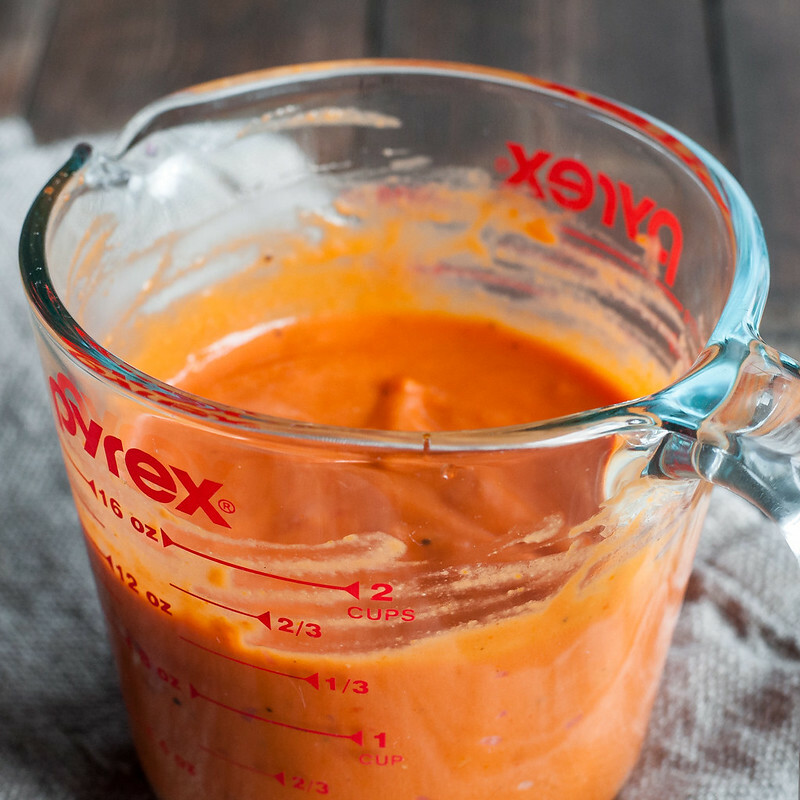 Besides fresh tomatoes, creamy tomato dressing is built much like a vinaigrette. Crushed garlic infuses acidic lemon juice as the juice simultaneously tames chopped shallots and dissolves necessary salt. The finished purée of fresh and sun dried tomatoes–double the summery tomatoes–is combined with that shallot mixture after the garlic has done its job. 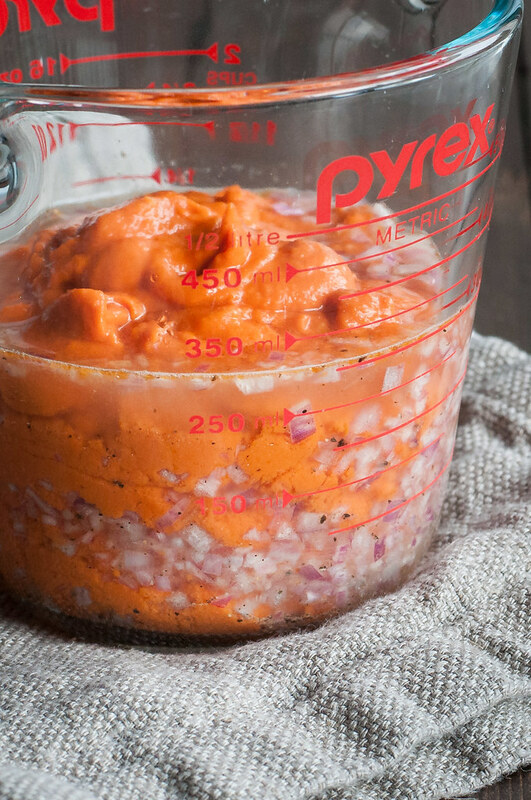 The process that ended in creamy fresh tomato dressing started with Melissa’s sun dried tomato vinaigrette. You probably couldn’t tell my creamy dressing was inspired by hers by comparing our recipes side by side, but hers is a fantastic, flavorful basic vinaigrette recipe. Try it if you’re dressing greens instead of pasta (or making her sun dried tomato bowl). Have you noticed anything different over (or down, if you’re on mobile) in my sidebar lately? My hope is that you didn’t, but I am running one or a few, depending on the page you visit, ads now. Yep, they’re new. At this point, my goal in blogging is not to turn it into a living salary, but I’m trying a few things to cover the costs of web hosting, photography props, and recipe testing ingredients. I know this isn’t much different from every other food blogger, but I like to keep it transparent around here. It’s difficult for me to find blogs where I really trust the author, but that’s the way I want it to be here. You can find I recipe anywhere, but you just can’t build relationships or a like-minded community by reading a cookbook. My goal with the blog, besides getting to know you, is to help you explore new, healthy, delicious culinary avenues and to make getting dinner on the table easier, but if you don’t trust me and come back, that’s a moot point. All that said, I don’t know what ads display when you view my site (more on that here). If you see any objectionable or contrary ads, such as for Velveeta or Suddenly Salad, don’t hesitate to let me know. I do monitor this and don’t want ads you’re seeing to conflict with the healthy message of Natural Comfort Kitchen. To summarize this post in a single equation (errr, 2 equations), Suddenly Salad = NO and creamy fresh tomato dressing = yesYesYES!!! Need more tomato recipes? I have them for you! In a 2 cup liquid measuring cup, combine garlic, shallot, 1 teaspoon salt, a few grinds of black pepper, and lemon juice. Let stand 5 to 15 minutes. In the meantime, pulse sun dried tomatoes, fresh tomatoes, dijon, maple syrup, water, and oil in a blender or food processor. In the blender, it may take a few minutes of working up speed until the mixture is smooth but thick. Remove garlic from shallot mixture and discard, then add tomato purée to the measuring cup and whisk until well mixed. Season to taste if needed (mine didn't need more seasoning). Set aside in refrigerator until needed, even if only for a few minutes. As written, the recipe is vegan and gluten-free (always check your ingredients when an allergy is involved). Inspired by Melissa's sun dried tomato vinaigrette. Note: This page contains affiliate links. It does NOT contain sponsored content. Affiliate links (to products I recommend, on Amazon) offset my ingredient and website maintenance costs, so I can keep bringing you emulsified recipes like this one. Thanks! Excellent, let me know if it’s kid friendly! I don’t have any little ones to experiment on yet, so I’m always curious.